wifite is created to attack multiple WEP and WPA encrypted networks at the same time. This tool is customizable to be automated with only a few arguments and can be trusted to run without supervision. 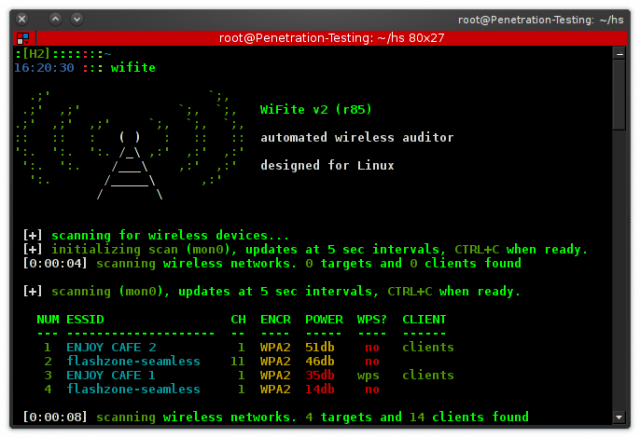 It’s a great tool to script into part of a toolkit for Wifi security assessments and is a handy wifi wep key cracker. The biggest change from version 1 is support for “reaver”, a Wifi-Protected Setup (WPS) attack tool. Reaver can compromise the PIN and PSK for many routers that have WPS enabled, usually within hours. how to use it?? can’t understand anything!